As SEMA (Specialty Equipment Market Association) swings into full speed this week in Las Vegas, automakers and aftermarket tuners begin unveiling their latest one-off creations. While most vehicles on display at SEMA are packing heat under the hood and radical exterior designs, Lexus’ offerings fly virtually under the radar by comparison — at least in terms of looks. This year, Lexus, in tandem with the California-based tuner VIP Auto Salon, built a 2013 GS 350 F Sport and fitted it with a custom supercharger kit from Apexi. Complimenting the Apexi supercharger are an Apexi Smart Accel Throttle Controller and a PTS Joe Z Series True Dual Header-Back Exhaust system. Sadly, Lexus hasn’t given any horsepower figures for the one-off creation but we can assume the supercharger adds a big power boost to the stock 306 horsepower figures. 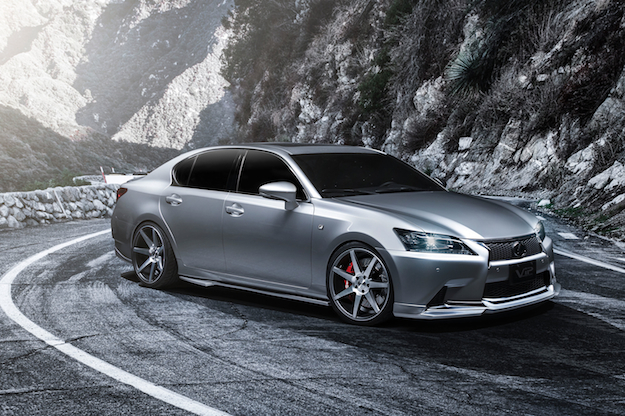 Adding the supercharged GS to Lexus’ quickly growing stable of F Sport models, we are hoping the supercharged GS indicates that Lexus is moving towards producing more, higher-power models in the near future. Although the GS isn’t bright orange and covered in fins like so many other SEMA creations, it has had its body tinkered with. Lexus and VIP Auto Salon have added — spoiler alert — a WALD International Aero Package, including a front lip spoiler; a side skirt set; a rear lip spoiler; a trunk spoiler; and roof spoiler. Upgraded, too, are the wheels, suspension, and brakes. A set of 20-inch Vossen CV7 wheels have been bolted on to accentuate the RSR Super i Coilover System suspension that gives the GS an aggressive stance. Tucked nicely behind the wheels, and bringing the supercharged GS to a rapid stop, are a set of Brembo High Performance GT brakes. Also on display from Lexus at this year’s SEMA is a 2013 LS 460 F Sport, which has been tuned by Five Axis, in addition to the Paris Auto Show-unveiled LF-CC concept car.